Surely not even Lee Corso would have been able to alter God’s plan for the 1972 Auburn Tigers, but had he had his way, he would have given it his best shot (“Not so fast, my Lord!”). 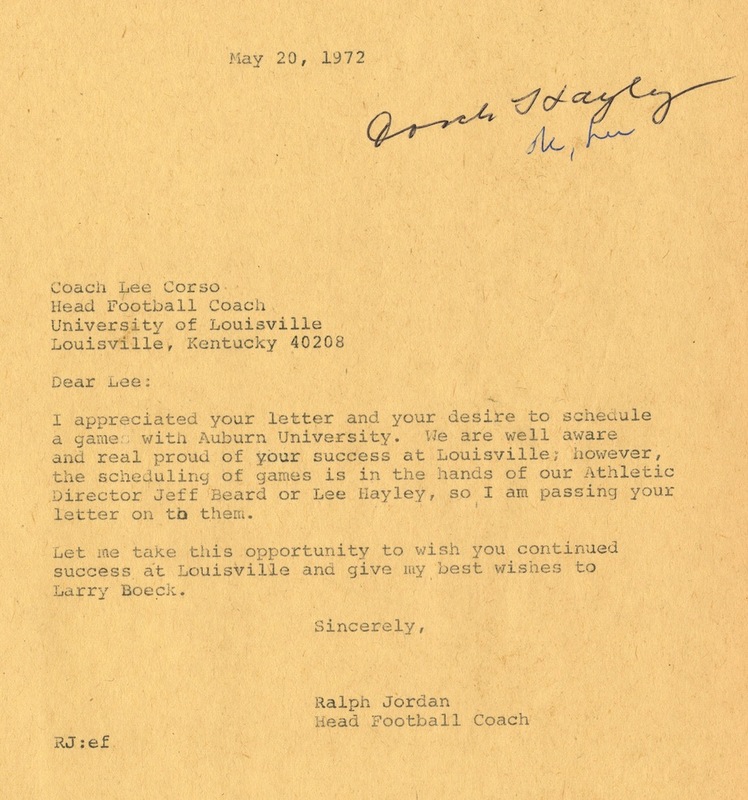 Corso wrote Shug Jordan in April 1972 hoping to schedule a season-opening game between Auburn and Louisville. The Cardinals would come cheap and they’d be happy to move one of their game around, and both teams could start practice early, and hey, it’d probably be a gas. It probably would have been. Corso led the Missouri Valley Conference Co- Champion Cardinals to a 9-1-0 record, Louisville’s best up to that point and Corso’s best as a head coach. And the Amazins will all tell you—the team they struggled with the most outside of LSU, who handed them their one loss (but who they still felt like they should have beaten), wasn’t Tennessee or Georgia Tech or Georgia or even Bama—it was lowly Chattanooga, a 14-7, win in the second game of the season. Read the letter, and Shug’s response, below. Click to enlarge. 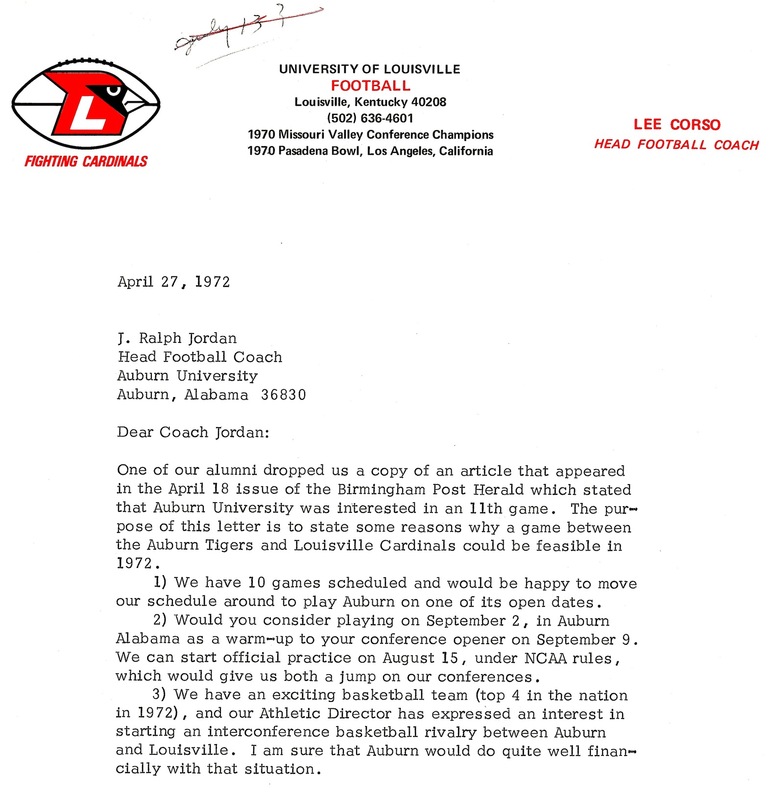 It didn’t happen in 1972, but the letter likely lead to Auburn scheduling Louisville for its season opener two years later. Auburn beat the Cardinals 16-3 in a half-empty Legion Field. I was at that 1974 game – It was a night game and it was indeed poorly attended. As I recall, the BIG fight was with Oregon State at the 1973 opener in B’ham (we were at that one as well). I don’t remember a fight at the Louisville game. Think you’re right, Tom — got it confused. Thanks! Now that’s neat. 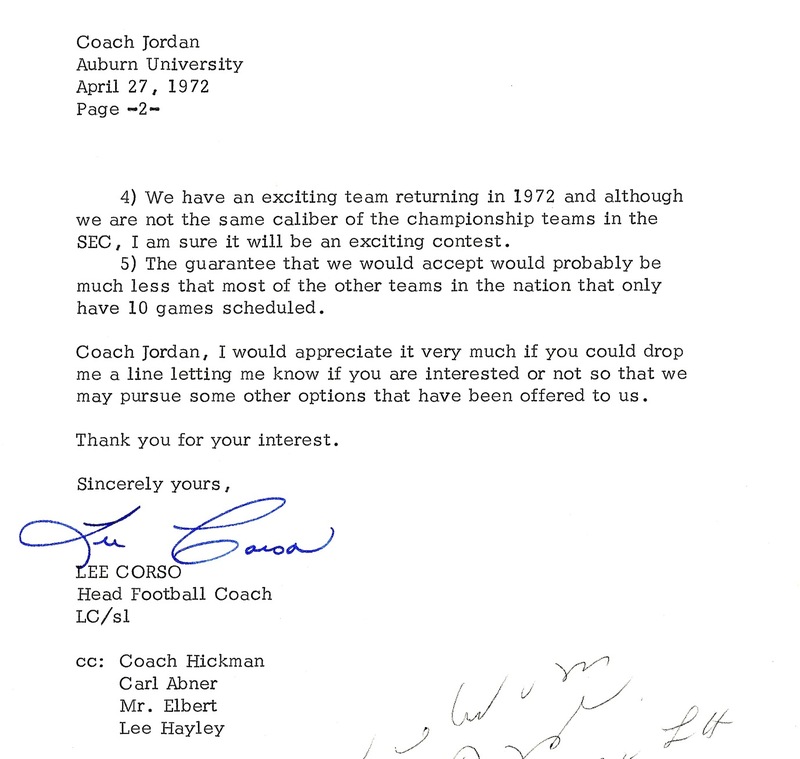 Always fun to find little things like this in Auburn history. Appears Corso was using some kind of fancy 1972 word processor? Clearly Jordan was stull using the one-letter-per-column typewriter.